Dorset County Council has made a Notice under Section 14  of the Road Traffic Regulations Act 1984 as amended. All vehicles will be prohibited from proceeding along Blandford Road North, Upton between Wimborne Road and Old Wareham Road a distance of approximately 700 metres. The notice is needed in order to comply with Health and Safety Regulations which require the provision of safe working areas and to minimise the likelihood of danger to Highway Users. It will come into operation between 09:00 – 16:00 on the 25th February 2019 and remain in force for 5 days. However it is anticipated that the works will be completed by 1st March 2019. The road will be open outside of these times. Please note that the dates are a window of opportunity and the road may not be closed for the whole duration stated above. The closure is also weather dependant. 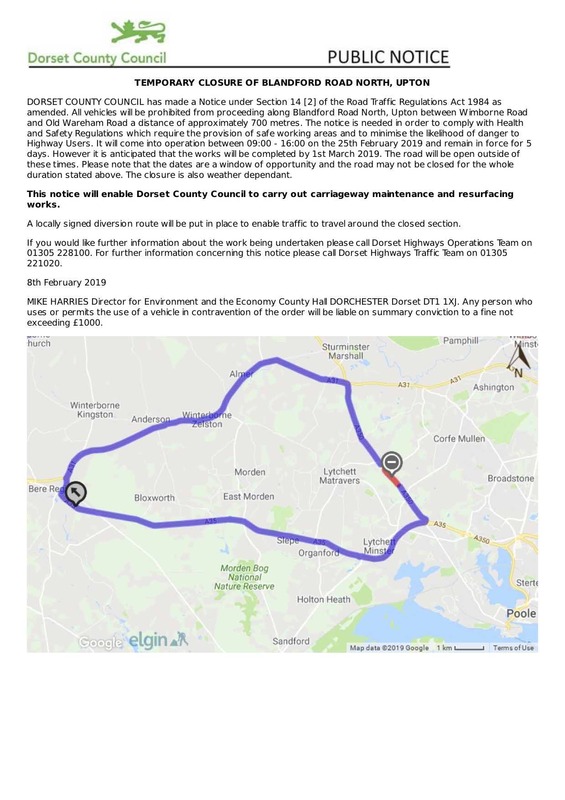 This notice will enable Dorset County Council to carry out carriageway maintenance and resurfacing works. A locally signed diversion route will be put in place to enable traffic to travel around the closed section. If you would like further information about the work being undertaken please call Dorset Highways Operations Team on 01305 228100. For further information concerning this notice please call Dorset Highways Traffic Team on 01305 221020. Any person who uses or permits the use of a vehicle in contravention of the order will be liable on summary conviction to a fine not exceeding £1000.